Watermelon is a fruit which belongs to the Cucurbitaceae family. It also being loved so much on summer. The juicy red flesh of watermelon attracts you and lighten up your taste buds. But do you know very well how the fruit can help you? Well, watermelon contains a lot of natural nutrients, which can help maintaining your body wellness. Check out the benefits below. Watermelon assists our health by cleansing the bladder and kidney, thus,reducing the germ build-up in the bladder. 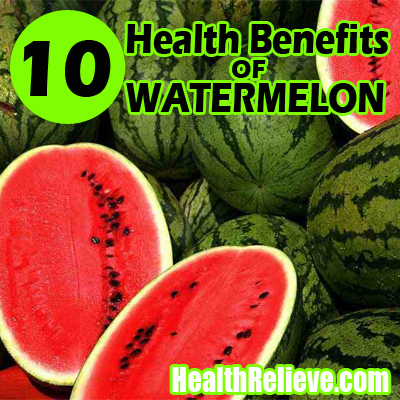 In addition, watermelon also help by preventing the formation of renal stones. Help for those who want to lose their weight because watermelon contains a low in calories. It can satisfy and control your hunger for a long period of time. Watermelon contains high quantity of beta-carotene, which help to solve problems, like vision defect and viral infections. Many-age related illness such as macular degeneration and cataract can be prevented by a watermelon. Beta-carotene in the watermelon is converted into vitamin A also help to treat bight-blindness and to prevent pigmentation in the retina. Based on the research done by a scientist,watermelon is helpful to increase the number of sperm count and sperm structure. It also acts as a natural aphrodisiac. A rich-containing of water in watermelon reduces the problems of dehydration especially during summertime. The existence of arginine in watermelon make it as supportive to reduce the blood pressure. Moreover, the combination of magnesium and potassium in watermelon also capable of dropping the blood pressure. Antioxidants, which help in reducing asthma attacks also a part of watermelon elements. Antioxidants decrease the effect of noxious substance inside the body during asthma attacks. Watermelon also rich in vitamin C which helps to boost immunity, prevent damage to cells and form new connective tissues. According to some of the researchers, watermelon can help in decreasing the problem of bad breath efficiently.